The day before the WWDC 2011 keynote, I posted an article with a number of predictions that I was making along with a promise to do a follow up to see how accurate that was. Having now watched the keynote video and had a chance to play around with iOS 5.0 (on both models of iPad and the iPhone 4), I'm now ready to take a look at what I believe are the most exciting changes coming around the corner. Apple did pretty much as expected by introducing a whole new notifications system. It was not, as I'd hoped, a part of the wasted screen space currently used for search but copied completely from Android by using a swipe-down gesture from the status bar. I'm still not convinced that this is the best place for it (as new users won't know to swipe-down from the top of the screen - there is no indication anything is up there) so we might see it move before iOS 5 gets made public. In terms of how notifications work, it is a similar system to Game Center with a nice Growl-style overlay appearing at the top of the screen - this is tappable to go direct to the app or you can ignore it and look at it in the Notification Center overlay. One thing I will say about notifications is that the customisable options are incredibly good - each app can be customised so you can have notifications show up in the old modal style (I do this for txts), the banner style, or not at all. 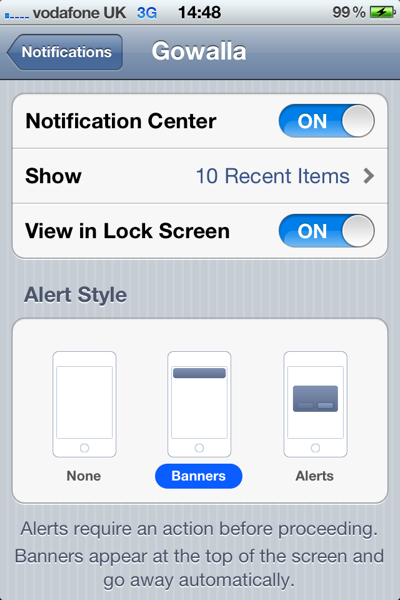 You can also choose whether they appear in the Notification Center, on the Lock Screen, and how many notifications an app is allowed to display. This was unexpected from me as Apple doesn't usually give you the option to personalise - whilst there is a lot of complexity in what can be done, they have laid it out in the settings in a very clear fashion. Speaking of "View in Lock Screen", this was something else I'd thought might be available. Notifications stack up in the unused space as they come in but the really nice touch is that you can slide a notification (just like the unlock slider) in order to go direct to that app. For example, if you had notifications for txts, emails, and Twitter, you could slide the email notification to go direct to that email. It's a minor thing, but saves a huge amount of time and is more effective than going to the app that last sent you a notification which was the default unlock action. In terms of widgets, there was a lot less than I had anticipated. Whilst there are widgets, there are only two of them and they're hardly exciting; weather and stocks. Thankfully, they can be turned off in the settings if you don't want them. If enabled, they reside at the top of the Notification Center which is as good a place as any but there is no option to put them on either the home screen or the lock screen. I disabled stocks (as I have little interest in them) but I've had weather enabled for the past 2 days. The unique feature they've added is localisation in that it uses the GPS to show you the weather where you are - sure enough, it flips between London and Surbiton depending on if I'm at home or in the office. But what is the point of the feature? 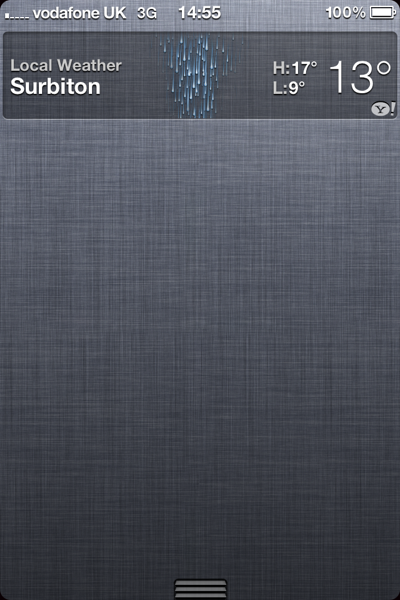 I looked out the window earlier to see it was raining - the widget qualified this by also saying it was raining. It would be far more useful to have a widget that shows weather at a specific location (e.g. is it raining in London whilst I'm at home) rather than what the weather is doing at your current location. Also, whilst you can swipe the weather to get a forecast it doesn't remember this setting the next time you look at it (so I'm always having to swipe to see the bit that could be of interest). I'm sure we'll see the ability to create widgets at some point, but probably not for the launch of iOS 5. Adding the ability for 3rd party devs to create them (i.e. having a Facebook widget) would be a good move in my opinion and would be even better if they could be added to the lock screen. Aside from widgets and the notification positions, the rest of my iOS 5 predictions were on the mark. Wireless syncing with iTunes is in complete with delta updates (so you no longer need to download 500MB update every time they update the OS). As a bonus, when syncing with iTunes, you can still use the phone even if you are plugged in via a cable. This makes a huge difference as getting a txt just before you start a half hour import of all your music is very tedious! Game Center saw a number of improvements and the new iCloud functionality allows for the saving of game state as I suggested. No word yet that FaceTime is working on 3G but that may happen before we get to the end of the beta period. Also, Apple quite often add additional functionality before going Gold Master so it's quite plausible that things will move around and we'll see the introduction of improved voice control. One interesting piece which I hadn't seen coming was the introduction of iMessage. This is basically a silent update to the Messages app so that when you are sending a message to somebody else who has an iOS device, it does it through your internet connection for free rather than via SMS or MMS. This is a genius move (and bound to annoy the people at RIM and the mobile carriers) as it means you can now use an iPod Touch as an iPhone when on WiFi (as you have iMessages and FaceTime). The UI works incredibly well with the colour of the speech bubbles and some minor differences in text to differentiate between a free message and a paid message. It also automatically updates on all of your devices so you have all of your conversations no matter whether you are using an iPad or iPhone. All in all, a very good update. As I'd thought, there wasn't a lot to say about Lion although they did spend half an hour going over all of the pieces that had already been demoed in the past. The most interesting announcement was that Lion was going to retail for $29.99 and would only be available via the Mac App Store. This is another bold move from Apple but there are a lot of details left open (which my Twitter feed is full off!) such as "what happens if I want to reinstall from scratch" and "what if I have no internet connection". I'm sure Apple will address these in good time but my gut feeling is that Lion will update the BIOS on your machine in order that you can install from the Mac App Store. At the moment, holding "cmd" allows you to boot from CD, USB, or over WiFi network from another machine so it wouldn't be a stretch for that WiFi support to expand to connect to the Mac App Store to download the OS. Lion also creates a backup partition from which it can restore itself so that would solve many problems. In my last article I did briefly mention that AirDrop might be expanded to allow wireless file sharing with iOS 5 - as iOS 5 didn't get an updated file system, this didn't materialise but it might be something that appears in later versions (e.g. iOS 5.2). The other speculation I had was that iBooks would make it to the desktop - again, this didn't happen but iTunes has been updated (for Snow Leopard users as well) so that you can now purchase books on the desktop and have them automatically sent to your iOS devices (with support for iOS 4.3 available now as well). This is a good step but I'm sure we'll see iBooks in the Mac App Store soon. This was the one piece that nobody knew much about and was therefore the most anticipated - it certainly didn't disappoint. Everybody had agreed beforehand that there would be some sort of iTunes-sync system so that you would be able to access your iTunes library everywhere. Unfortunately, I hadn't thought that this would be US only (in that you still can't redownload your purchased music outside of the US). This is most likely due to the legal licenses required and, if past experience is anything to go by, it will most likely be 6-12 months before we see sight of that here in the UK. However, the fact that it's coming is noteworthy in itself and is a good push for the music industry. 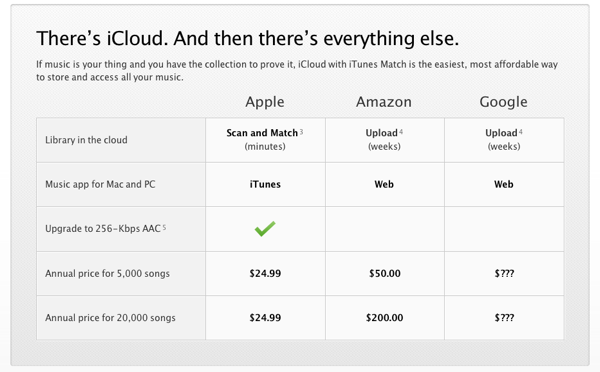 There is still no sign of a subscription iTunes deal (i.e. pay $9.99 a month and get free streaming access to all iTunes content) but I'm sure that will be appearing at some point in the next year now that they've made such headway with iTunes Match (which is a much bigger legal minefield). In terms of the rest of iCloud, it was pretty much as I'd had it on my wish list. Completely free syncing of all your information between all devices along with 3rd party APIs so your apps can sync state as well. The API looks well thought out and very easy to use so I'm sure uptake will be strong from other developers. Making it completely free across the board was also a brilliant move. I had speculated that there would be a "one more thing" which would deal with the Apple TV. My dream has been for developers to be able to use the Apple TV as a secondary screen for their apps rather than using a component cable plugged into a HDTV (which works, but isn't a graceful solution). Whilst it wasn't mentioned, the Keynote did have one slide showing "AirPlay Mirroring" which turns out to be a solution just for the iPad 2 allowing you to mirror everything on the screen to your Apple TV. This isn't AirPlay, this is fully baked in mirroring of all apps with no way for developers to disable it (so I can finally watch BBC iPlayer on my Apple TV). It's not without flaws at the moment (quite jerky probably as rendering on two screens - it could turn off the iPad screen really but doesn't) but I'm sure these will be ironed out before launch. Update: I've now posted an article entitled AirPlay Mirroring, TV Out, and the Apple TV as a games console. Overall, the WWDC 2011 Keynote was one of the best Keynotes in recent years. Whilst the 30 minute ramble about Lion (which we'd already seen) probably wasn't necessary, the low price-point and Mac App Store only made it interesting. iOS 5 is a massive leap forward with a number of very interesting features (including custom text message tones.. finally!) and iCloud is going to be an incredible revolution once 3rd party apps get updated to use it. As a user, I'm excited by the new software coming out, but I'm even more excited as a developer. There is a huge amount of documentation to go through but what I've seen so far has been nothing short of exceptional. It looks like 2011 is going to be another great year for iOS.